Echoing similar sentiments, Shri Athouba, General Secretary of United Committee, Manipur(UCM) during a discussion on Impact TV on 29th January, 2019 said, “At last, I am making an appeal. Manipur People against Citizenship Amendment Bill(MANPCAB) feel that we, the indigenous people of the north-east, are on the brink of extinction. People of Manipur should rise now; when we launch an agitation, people should not hesitate in joining us. Unitedly, we should try to save Manipur”. 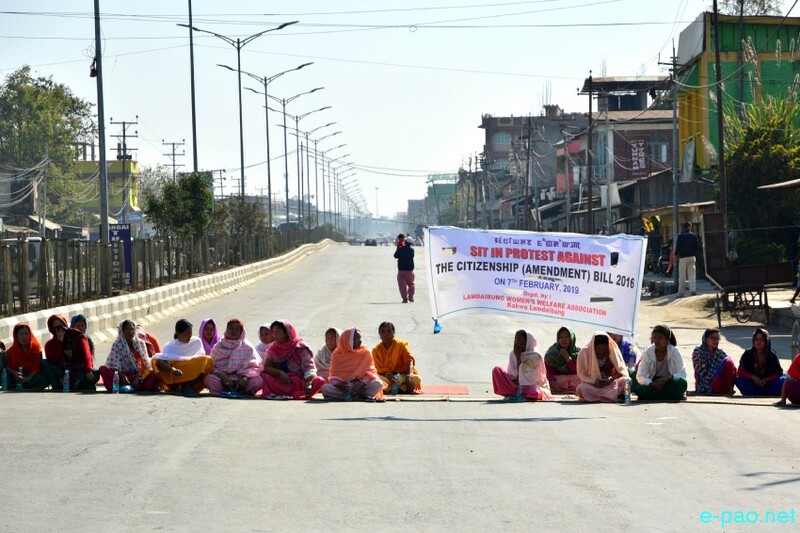 Several other civil society organizations and student bodies in Manipur have been continuously expressing their fear of marginalization of Manipuris as a result of passing of Citizenship Amendment Bill. After the CAB is passed by the Rajya Sabha and assent from the President of India is obtained, the new law will renderillegal immigrants who are Hindus, Sikhs, Buddhists, Jains, Parsis and Christians from Afghanistan, Bangladesh and Pakistan, eligible to become Indian citizenship. The main argument of Government of India is that such people have come to India as they were persecuted in these three countries. Through the amendment mentioned herein, the minimum number of years of residence in India by illegal migrants from these three countriesto be eligible for seeking citizenship is sought to be relaxed from 11 years to 6 years.What are the possible consequences and impact on Manipur on account of enactment of the Citizenship Amendment Bill, 2016(CAB in short) and grant of Indian citizenship to a huge number of illegal Hindu migrants to India, mainly from Bangladesh? Before coming to the prediction of possible consequences of grant of citizenship of India through the amendment, it may be worthwhile to look at the figures of migration of Hindus from Bangladesh to India. We may ignore the migration of Hindus from Pakistan and Afghanistan to India as it is quite unlikely that they would come all the way to Manipur in search of economic opportunities. After the British left India in 1947, the country was divided into mainly Hindu country called India and Muslin Pakistan comprising of West and East Pakistan(present Bangladesh after liberation). It was estimated that 3 million Hindu Bengalis migrated from East Pakistan to India in 1947 alone to live mostly in West Bengal and other cities of India.After partition, there have been many waves of migration of Bengali Hindusto India due to atrocities and economic reasons. In 1950, it is estimated that a further one million refugees crossed into West Bengal, particularly in the aftermath of 1950 Barisal riots and Noakhali riots. Another major influx into India came in 1971 during the Bangladesh Liberation War, when Hindu refugees escaped systematic mass killings, rapes, lootings and arson. It is estimated that around 10 million East Bengali refugees entered India during the early months of the war, of whom 1.5 million may have stayed back after Bangladesh became independent. Influx of illegal migrants from Bangladesh continued through the porous border between Bangladesh and India. The National Register of Citizens in Assam recorded about 40 lakhs illegal immigrants in that State. It is a common knowledge that Bangladesh immigrants-Hindus as well Muslims have settled in many parts of the North East including Manipur. On passing of the CAB by the Rajya Sabha, all illegal Hindu migrants, who completed 6 years of residence in India before 31st December, 2014 would be eligible and become citizens of India. They are mainly concentrated in the North-East India and West Bengal even though they are found in big cities like Delhi, Mumbai, etc. Once Indian citizenship is acquired through the amendment, they will be at par with any other citizen of India in terms of protection granted by the Constitution of India, welfare benefits of several schemes of the Union Government and State Governments where they live and political rights of voting and contesting election. Although the Citizenship Amendment Bill is meant for illegal immigrants belonging to the six religions of Hindu, Sikhs, Buddhism, Parsi, Christians, and Jains, many Muslim migrants may seek Indian citizenship by converting to one of these religions. Many Hindus in Pakistan converted to Muslim to continue to live there after partition as the losses and suffering to be incurred on leaving Pakistan for India after partition was enormous. In Manipur, we have seen the election of Shri Kishore Thapa , a person of Nepal origin and Ashab Uddin, a person believed to be from Bangladesh,to the State Assembly of Manipur. With continuous migration of outsiders and immigrants from Bangladesh and Myanmar, political rights of indigenous people of Manipur will be compromised over a period of time. This fact is already established in Tripura, where indigenous people now constitutes about 31 percent of the total population due to influx of people from neighbouring Bangladesh during the partition and India Pakistan war of 1971 for liberation of Bangladesh. From economic point of view, the indigenous people are going to lose to migrants on many counts. Traditionally, migrants are much more hardworking and willing to do any kind of odd job in order to survive. Further, culturally, migrants anywhere in the world have better savings habits and over a period of time, important assets of indigenous people will get transferred to migrants. There are reports of alienation of land of local people of Assam to migrants on a large scale. Gradually, the Assamese in their own land became landless. The Telegraph newspaper reported on 14th May, 2018-A section of “corrupt” revenue department officials in Assam are helping in illegal transfer of indigenous people’s agriculture land to non-indigenous traders and “illegal migrants” from Bangladesh for non-agricultural use, says a committee on land rights headed by former chief election commissioner H S Brahma. Same thing will happen in Manipur when migrants settle down in Manipur. The fear of indigenous people of Manipur losing their distinct identity and language when migrants overwhelm them is also not without any basis. Intermarriage is the most common phenomenon when migrants live in the neighbourhood of local population. Culture will be constantly under threat as it will be contaminated with the way of life and many other aspects of migrants. Any community and society, proud of its culture and identity, will justifiably resist any attempt to dilute their existence by a new force. The strong voice of resentment and resistance by the student bodies, civil society organizations and most of the political parties in Manipur except the ruling party is not without valid grounds. It is to be seen if the voice of dissent and apprehension of the people of Manipur is heard by the Union Government. This article was webcasted on February 09 2019.